North Yorkshire Dales bed and breakfast accommodation at Askrigg in Wensleydale is available at the historic White Rose Country House Hotel and Inn. North Yorkshire Dales bed and breakfast accommodation at Askrigg in Wensleydale is available at the historic White Rose Country House Hotel and Inn. Hotel and country inn bed and breakfast accommodation in the north Yorkshire Dales National Park is much sought after by holidaymakers and visitors to Askrigg, Wensleydale, Swaledale and the north Yorkshire Dales National Park. There is a wealth of such holiday accommodation, but amongst the very best is the White Rose Hotel at Askrigg. For more information you can also visit our main website. The White Rose Hotel and Restaurant, formerly a 19th century residence, has been carefully and sympathetically refurbished to create a family-run hotel in the heart of Askrigg, the location for many of BBC Television's James Herriot's All Creatures Great and Small TV series. Askrigg is also a popular starting point for walkers. There are many circular walks, some taking in Mill Gill and Whitfield Force, the local waterfalls. It is also a convenient touring base for the Yorkshire Dales and the southern part of the Lake District. A day trip to York or the North York Moors National Park and Yorkshire's Heritage Coast is also quite convenient with good road communications. We are a family-owned and managed hotel, which is noted for its comfort, friendly ambience and great food. 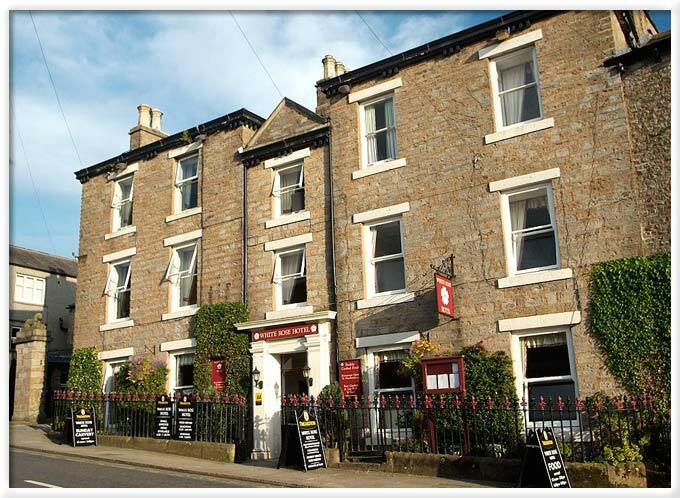 This stone-built hotel is full of character and has been recently refurbished. Being family-run you can be assured of a friendly and most personal service and attention to ensure your stay is as wonderful as possible, possessing a real Yorkshire and Wensleydale welcome. The hotel’s bedrooms are appealing and provide comfortable and clean accommodation. Whether you are looking for bed and breakfast accommodation, half board or full board... or you are looking for a weekend break or special break, the White Rose Hotel at Askrigg is the accommodation choice for you. There are twelve bedrooms, all with full ensuite facilities, room controlled central heating, colour TV, radio, hair dryer and hospitality trays. The bedrooms have been comfortably furnished with most retaining the original fireplaces and panelled window shutters. King size rooms, Superior Double rooms and Double or Twin rooms are available. Amongst the excellent hotel facilities are a Games Room with Pool Table. The Hotel also has the character of a Dales country inn as there is a lovely traditional Yorkshire bar, as well as a pretty beer garden at the rear. In addition we have excellent dining in our traditional White Rose Restaurant and new Orangery restaurants.